i liked this tutorial very much. the pace is fine. no waste. if i needed to retrace no problem. just back up the truck. Wait… is your name Jared? Very much liked and saved me a lot of time that I don’t have.This gave me all the basics that I need I now know what exists and know that it can be done, I will return here or when I need to be exact on the syntax. Great stuff. I’ve learned more from your site and another than in several books. Is this the correct order, or should it proceed numerically (Part 1, Part 2, etc.)? Thanks, again. I’m in a Digital Media Masters program and this is helping me immensely. Yes I intended people to watch them in that order. You can do which ever feels best to you. The first tutorial was based off of how I thought I should teach. The second is based off of what users told me they wanted. In the end I think the users were right and the second version is much better. I’m very glad these are helping you. I hear professors are actually telling their students to watch them. I find that extremely funny since I’m self taught. Before I saw your video I had seen 60 different videos and could not make sence of what was important or not. I was more confussed then when I startet. Can I propose a new video all you need to know about closures. And all you need to know about function. Thank for very good turtorials. Best regard Rookie. Thanks. Yes, you’d be surprised how little they teach regarding languages. The goal, it seems, is to start doing something with them, which is putting the proverbial cart before the horse. Personally, learning from these videos works far better than books as I can see the cause and effect on screen and listen to someone describe what’s happening. You’re doing a valuable and altruistic service. Please let me know if there’s a PayPal donation area for you. I’m glad you like the site. Don’t feel the need to donate. Everything is meant to be free and without subscriptions or anything. I want to eventually be a free university, but that will take some time. If you like my site just tell others about it. While I never took any computer programming classes I did experience a little college and can remember the situation. Where I went the class sizes were in the hundreds and there was little one on one time provided. Sorry to be a bother, Derek. 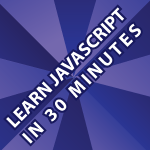 But is there an actual difference in the inf in the two different sets of JS tutorials? I like the fast ones but I still need a little slower pace. Just wanted to make sure I’m getting the same info. Thanks. thanks a lot…its fine if you can’t, ill just check out the java one. You’re very welcome. I have many more tutorials, on a wide array of topics planned. yeah! going over to your jquery tutorials real quick. DUH, I was just getting intimidated. I was missing end parentheses, so nevermind the question. Thanks for the tutorials! Thanks for all these great tutorials, very helpful! Do you know of a good way to obfuscate e-mail that’s clickable? Just incase the client wants the phone and e-mail visible to humans. Thank you 🙂 I’m glad you liked it! Started following your videos recently. I like the speed at which you deliver these sessions which makes your videos stand out from others. First of all thank for these Excellent Tutorials! I have to ask, Are these tutorials the same as that on your youtube channel? Thanks allot for the tutorials, your explanation is very good. THX so much! You helped me to save a huge amount of time! deal more time & energy than many of your viewers realize. getting very frustrated with all the OOP & CompSci noise until I found you. You are very very welcome 🙂 Thank you for the kind words. After making a few hundred videos it gets pretty easy. I’d say the hardest part is figuring out the best way to teach things. I’m determined to approach other topics that people seem to struggle with like Chemistry, Physics and Calculus. It brings me great joy to make a video that I think will help people. The comments sent in that tell me the videos work help more than you can imagine. Superb work! Thanks a lot. Do you have any other videos like this? I request to you to make a video series on JSPs.. I learnt many things from you but not JSPs. I very well can handle this JSP but, i guess the only way i can master it is by seeing your tutorials..
Hope you consider my request..
Really great site! Thank you. Why is all the code he is writing commented out with, ? What seems to work best is to print out the code and take notes as you watch in your own words. If something doesn’t make sense, write down the question and I’ll try to help. Experiment as much as possible and try to have fun. Eventually it will start to make sense. I’m very happy I could help. That is exactly what this tutorial was for. For completeness you have forgotten the code of the function. That was silly of me. Sorry about that.